Karyn Schoenbart is CEO of The NPD Group, a global provider of information and advisory services to the world’s leading brands. A working mom, she often gave career advice to her daughter Danielle as she was growing up. By the time Danielle entered the workforce, she joked that she had received a “Mom. B.A” giving her a tremendous competitive advantage. 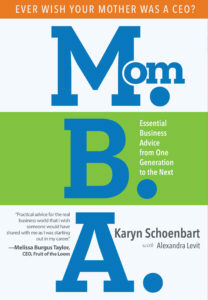 Now years later, Karyn has written MOM.B.A: Essential Business Advice from One Generation to the Next, based on her “lessons” to Danielle as well as on her thirty years of experience building a successful career. The book, filled with wise advice and numerous personal anecdotes, is noteworthy for Karyn’s candor and her delightful sense of humor. I recently spoke with Karyn about her favorite tips for those just starting out or climbing the corporate ladder. What’s the best way to make a good first impression? It starts with how you show up. It’s important to dress appropriately for the occasion. But that doesn’t mean it is a “one size fits all” rule. Dress the way that matters to the people who matter. And when in doubt, find out! A few years ago, we were looking for someone to fill an executive position that would report to me. One of the candidates came to the interview in a very low cut dress. She was clearly qualified, but we didn’t know what to make of her choosing that particular dress for the interview. In the end, we all agreed: The candidate’s attire demonstrated a lack of judgment, and we didn’t want someone with poor judgment helping to run our company. We didn’t hire her. How you speak is also a reflection on you. Avoid bad vocal habits like the dreaded up-speak (where every sentence ends as though it is a question). In my experience, people like it when you call them by name – it shows you care. Make it a practice to remember and use people’s names. My tip for remembering names is to use it three times when meeting them; when introduced, during the conversation and finally when saying goodbye. It really works! How do you build a good relationship with the boss? Be the person your boss can count on. Step up and go above and beyond. Every positive interaction that you have is like putting money in the bank. Then if there is a problem, you have something to withdraw. Think of criticism as an investment in you. Your boss is taking the time to help you be better. It’s also a good idea to get to know your boss as a whole person. Find out what matters to him or her and show an interest. One way to break through is to check in on a Monday or Friday, which creates an opportunity to interact on a more personal level (i.e. do you have any interesting plans for the weekend?). 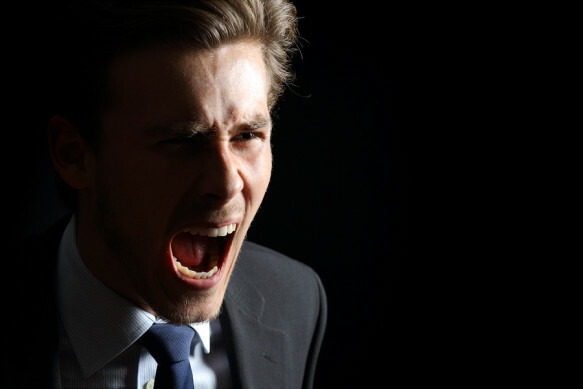 What advice do you have for surviving the occasional bad boss? What if chasing balance was actually making us unhappy? What’s the true purpose of work? 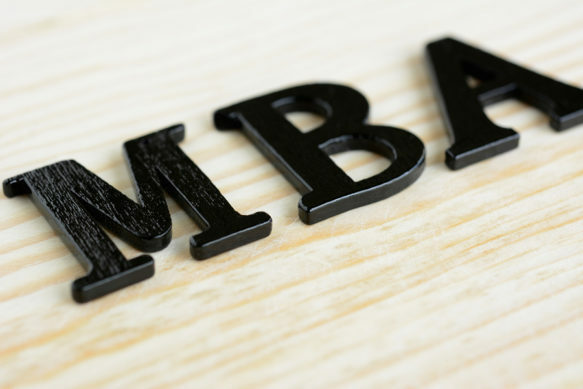 Personal and professional growth. We often think they’re different. We live our lives as if the personal and professional are in neat little silos, as if one didn’t affect the other. I’ve often said that leaders help people with the personal, not just the professional. And sharing a little of the personal may make a big impact in the professional. And so, when I read Jonathan Raymond’s new work, Good Authority: How to Become the Leader Your Team is Waiting For, I was excited to find a book that explained why this is…and how to use it to become a better leader. 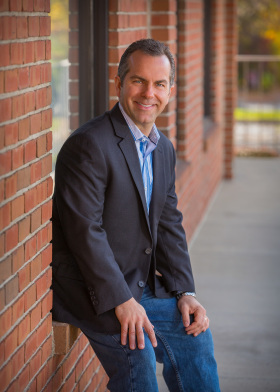 Jonathan is the former CEO of EMyth and now the owner of Refound, an advisory firm that offers leadership training and coaching. And I think his take on “good authority” will have you nodding along with what we want from the very best leaders. Contrast good versus bad authority. What are a few attributes you would think of? I’d say the first attribute is in the willingness to own your role as an authority in the first place. I see too many modern leaders try to abdicate that responsibility, either outright or in subtle ways, and try to be nice at the expense of giving people the boundaries they need to grow. The main attribute of bad authority is when a leader doesn’t own their contribution to a stuck dynamic or problematic situation. For example, a leader who hasn’t provided a reasonable timeline to reach a goal and then blames the team for not delivering on it fast enough. Good authority is the art of owning your contribution, being transparent with your team, and then moving forward in a collaborative way. Would you share a little about the concept of “borrowed authority”? Borrowed authority is the idea that until we investigate the beliefs about authority we inherited from our parents and teachers – not to mention the business culture in general – we’re still borrowing our leadership style from the past instead of discovering the one that genuinely expresses who we are today. In Good Authority, I offer that the opposite of Good Authority isn’t bad authority, it’s borrowed authority. 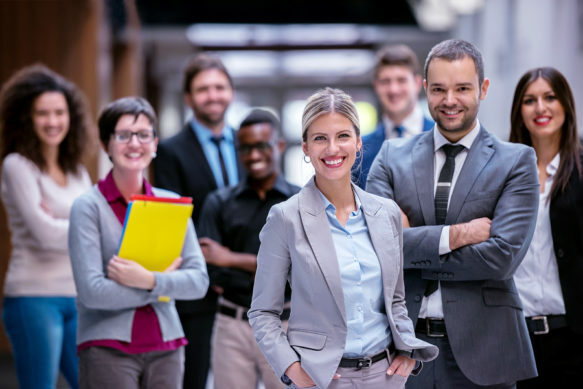 What I mean by that is that most leaders have good intentions, but until we do the work, we’re bogged down by ideas and beliefs about what it means to be the boss that hold us back and create pain and confusion for the employees in our care as a result. I want to ask about organizational culture. You say, “Nobody sets out to make their employees overwhelmed, stressed-out, and miserable.” I have to say that I read that and laughed, thinking, “If Jonathan only met one of my bad bosses, he’d think differently!” You’re right, of course, but people are overwhelmed and stressed. What’s are some ways to change a culture into one that is positive, empowered, and driven? This may sound odd, but the first problem is bad math. One of the things I ask leaders to do is to add up all the time they’re spending (1) doing re-work for a struggling employee, (2) mediating their interpersonal conflicts, (3) answering questions that they should be able to answer themselves, and (4) complaining to their spouse, partner or friends about how frustrated they are. The pivot is incredibly simple and goes against our conditioning, which is why we typically avoid it. The key to create a positive, empowered and driven culture is the exact same thing that will get you out of being overwhelmed and stressed. Repressing what you see and feel leads to emotional, mental, and physical problems, and it keeps that data away from the one person who needs to hear it in order to grow. There’s an art to talking about work in a way that feels personally relevant to your employee, but it boils down to this: Give them feedback not about tasks and projects but about how they’re showing up as a human being. Make it about relationships, feeling their impact on others, how they avoid taking risks—those are the things that people will immediately see as helping them get better at work and at life at the same time. There’s a whole new type of organizational culture that opens up from that simple shift. What are some techniques you use to help coach someone who has problems with listening? How can we all learn to be better listeners at a deeper level? Before we talk about the deeper cut, one simple technique that’s often used in mediation applies well in the workplace in general. Have the person you’re trying to help repeat back what they heard before responding. Highlight for them what the gaps are between what was said (and, even more importantly, how it was said) and what they heard and how they interpreted it. There’s a lifetime’s worth of personal growth work there. At a deeper level, and this is something I work on every day, is to re-examine what we think our value is as leaders. 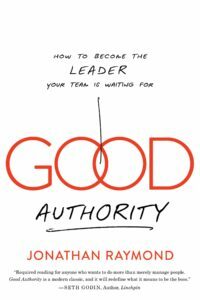 That’s a lot of what Good Authority is about: to learn how the highest value we can add to our teams, and in the rest of our lives, is to put our thumb on the side of the scale that’s about creating the space for others to discover that next better version of themselves, as opposed to tending to fill that space ourselves. I love leaders and have so much respect for anyone who throws their heart into a problem with no guarantee of success. The pivot is to see how not everyone works that way, and that to create the organization that can do more than you can on your own, you have to listen for those other voices. Finally, it comes down to not shooting the messenger. I can’t tell you how many organizations I’ve seen, in fact I’ve never seen one where this isn’t true, where one person becomes a scapegoat for the cultural dysfunction and is moved out (fired or pushed into quitting), and the message they were carrying never sees the full light of day. It’s a basic rule of group dynamics, but I see CEOs do it all the time, moving out the ‘disgruntled’ employee instead of leaning into the conversation and discovering the most powerful brand ambassador they’ve got. Tip: Focus more on who people are and less on deadlines and tasks. How about letting go of the past? What advice do you give to someone who is letting the past limit their future? Find a way to get in relationship with it. Meaning, when you notice yourself re-hashing or cycling in an old story, imagine a friend was telling you that story, what would you tell them? It’s a life’s work for sure, but learn to reframe our past in terms of how it made us the person we are today. I heard this phrase again recently that I absolutely love: “The past didn’t happen to us, it happened for us.” To be clear, I’m not suggesting people try and transcend or gloss over traumatic or otherwise difficult personal experiences, only that we hold a bit of double-vision about them. Let yourself feel whatever there is to feel about whatever it is that you feel it’s holding back. Cry, laugh, roll up the car window on the freeway and let out a yell from the depths of your soul. By giving yourself permission to let it be what it is all the way, only then do you open up the room to see it in a new way. The paradox is that you don’t have to do any additional work to do this. It’s the process of giving yourself permission to feel that brings that higher mind back online, and you can move forward with confidence and a sense of self that might surprise you.